How compatible (if at all) will Vive titles be with Rift &amp; Touch? Touch is shipping soon email. As a dev how can I get my hands on the Touch? Oculus Touch Tuesdays: I Expect You to Die! The First Thing You're Gonna Do With Touch? What options would you like to see for movement in open world games? Check out First Contact in Oculus Home without Touch already! 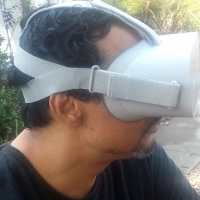 Any indication on if and when the Oculus Sample framework for unity gets updated with Touch example?